Inspired by Joe The Horse, borrowing from an honest man, and as an avid student of wave etiquette tips, I am not clear what should be done in the situation photographed above. If I was on a windsurfing board I'm pretty sure I'd sheet out a teense, then close my eyes. Dolphins surfing...ya gotta love it. I wonder what would happen if you showed these surfing dolphins a windsurfer throwing spocks and other new school freestyle...would they start jumping and landing fin first? 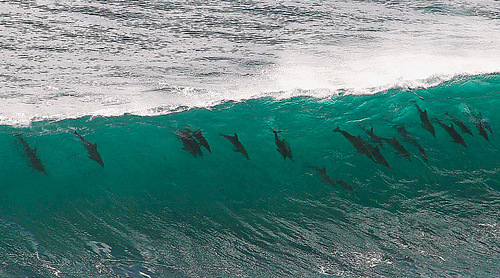 If Twenty Dolphins Can Share A Wave, Why Can't We? Jeff spotted this photo in an article in the Daily Mail. While a pod of dolphins has been hanging out in Sag Harbor recently, one dolphin made its way to North Sea Harbor just off the Little Peconic Bay, where it had to be rescued this morning after beaching itself. I've never seen anything larger than a snapper in the Peconic or its secondary bays, though old-school Puffins Bob and Nancy report that decades ago they were regulars in the Little Peconic. North Sea Harbor is a small but good sailing spot for beginning windsurfers to get comfortable when it's blowing SW, W, NW, N.
The Riverhead Foundation's Marine Mammal and Sea Turtle Rescue team did the good work. Their 24-hour stranding hotline is 631-369-9829. UPDATE: Apparently the dolphin had to be euthanized. Other dolphins are having a hard time in an Easthampton creek.